Injury to the lateral collateral ligament or LCL (the ligament along the outer side of your knee) can cause instability to your knee. Since the ligament connects the thigh bone to the small bone of your lower leg and ankle, LCL injury can cause symptoms like inflammation and lack of knee joint stability. An LCL injury usually occurs when the lateral collateral ligament is torn after a direct blow is sustained inside of your knee. This force results in stretching of the ligament on the outside of your knee, causing a tear. This injury commonly occurs in sports that involve quick and repetitive stops and turns, such as basketball, skiing, soccer, or those where violent collisions are involved, such as hockey or football. 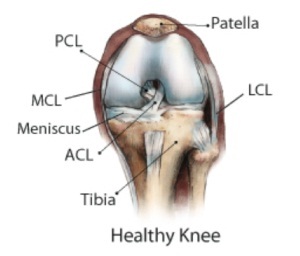 Most injuries in the knee involve the supporting ligaments, not only the joint itself. Injuries involving the collateral ligaments are often caused by forces that push the knees sideways, usually due to contact injuries. Repeated stress can also cause injury to the ligament due to loss of normal elasticity. Upon consultation, your doctor will ask about your medical history andsymptoms. He will conduct a physical examination to check on your injured knee, comparing it to the other one. LCL injury may be easily diagnosed with thorough physical examination. X-rays. This test will help find out if there is any associated fracture or broken bone, however, it will not show LCL injury. Magnetic resonance imaging or MRI. This imaging technique helps examine your soft tissues, including the lateral collateral ligament. Grade 1: There is minor pain and some tenderness at the injured area, showing that there are small tears in your ligament. Grade 2: The knee is noticeably loose, which is shown when your knee opens up about 5 mm when manually moved. There is swelling, intense pain, and tenderness on the inner side of your knee, which indicates that there are larger tears in the ligament, though not torncompletely. Grade 3: There is considerable pain, tenderness and swelling on the inner side of your knee as well as marked joint instability. When moved, the knee opens up about half an inch. This means that the LCL is completely torn. The anterior cruciate ligament may also be torn. Sometimes it may be difficult to evaluate the extent of injury or damage to the ligament because of intense swelling and pain in the knee. Your doctor may apply ice, raise your knee and ask you to use a light splint. When your pain is reduced, he may examine you again to make a more accurate diagnosis. Treatment for severe injuries may also include surgery, physical therapy and rehabilitation. Surgery may involve ligament reconstruction or repair, especially when other ligaments or structures are involved.